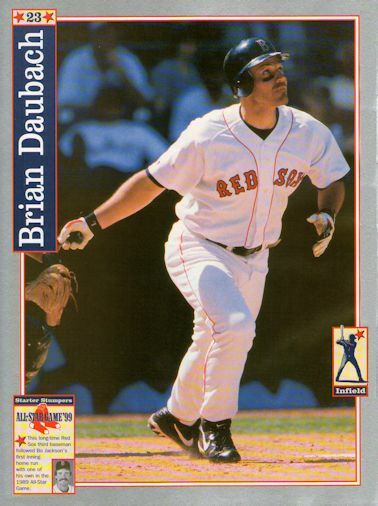 ON THIS DATE (August 16, 1999) ... Brian Daubach, after fouling off five consecutive pitches with the bases full, drove Tim Worrell's next pitch the opposite way, high off the Green Monster. Darren Lewis, who was on third base, scored. Butch Huskey, who was on second, scored. And Jose Offerman, who took off from first as Worrell released his changeup, crossed the plate with the run that gave the Sox a 6-5 win over the Oakland Athletics, one that resonated with meaning far beyond its immediate impact on the wild card race. Nothing compares to winning a game in Boston, in the bottom of the ninth. Turn on any TV, and you will see Daubach shedding any semblance of his Midwest reserve, leaping off second base as if he'd been shot out of a rocket launcher and throwing out his arms as if he could gather all of Kenmore Square in one giddy, glorious embrace. The crowd of 30,957, poised to file out after a near-miss, instead surrounded Daubach as he transformed Joe Mooney's infield into his personal dance floor, while Fenway Park organist Richard Giglio shook the Back Bay night with the strains of "Stars and Stripes Forever." Daubach has now driven in 15 runs in the last four games. Five RBIs Friday night, six Saturday, one Sunday, the three to win last night and cool off the A's, who were fresh off a three-game sweep in Toronto and had opened August with 11 wins in 14 games. The A's were one pitch away from drawing into a tie for the wild card. Instead, they fell two games behind the Sox, who have now won 8 of 11. Daubach is hitting .408 since the All-Star break, with 10 home runs in 26 games. He has 14 extra-base hits in his last 10 games. This afternoon, he was named American League Player of the Week. Tonight, he was claiming a higher reward, a niche of Red Sox lore all his own, as improbable a story line as any heard in these parts in a long time.